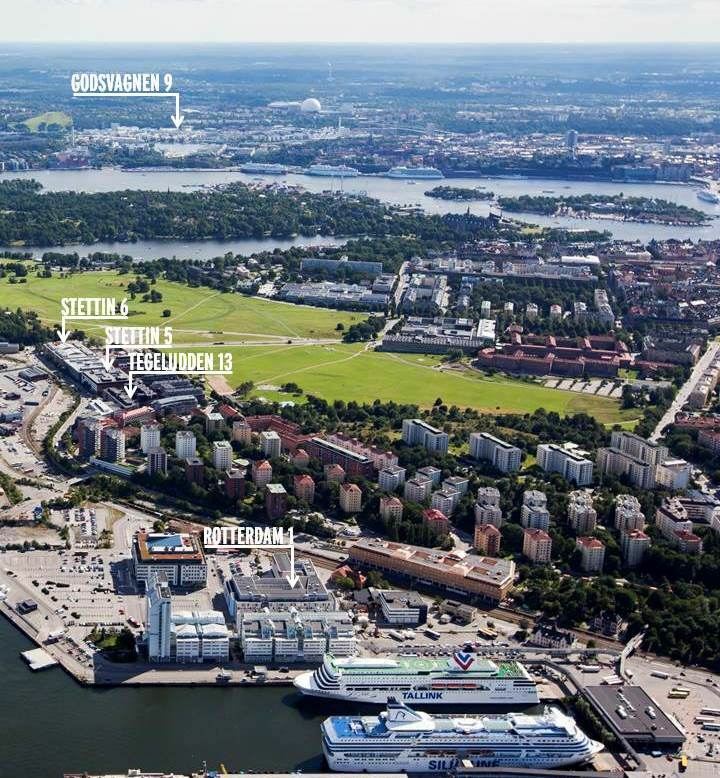 Kungsleden acquires four properties on Gärdet-Frihamnen and one in Hammarby Sjöstad, both Stockholm city districts, for SEK 3 billion and thereby creates a new inner city cluster. The leasable area totals 96,000 sqm. Kungsleden AB (publ) strengthens its position on the office market in Stockholm by acquiring four properties on Gärdet-Frihamnen and one property in Hammarby Sjöstad, both districts within the Stockholm inner city borders. The properties Rotterdam 1, Tegeludden 13, Stettin 5 and Stettin 6 are located on Gärdet-Frihamnen, while Godsvagnen 9 is located in Hammarby Sjöstad. Larger tenants include the Swedish Customs, the Swedish Fortifications Agency, Biz Apartment, Axfood and Procter & Gamble. The rent value amounts to SEK 200 million. The current occupancy rate is 92 per cent and the average remaining tenant agreement duration amounts to 4.4 years. Djurgårdsstadens Fastigheter AB is the vendor. With the acquisition, Kungsleden establishes an additional cluster with a total leasable area of 88,500 sqm, which will complement the company’s current office and hotel offering in the Stockholm region, e.g. the clusters Danderyd Kontor, Kista City, Västberga and Västra Kungsholmen/Vasastan. The properties on Gärdet-Frihamnen will be assumed on December 1 and the property in Hammarby Sjöstad will be assumed following completion of the construction, which is expected to take place in spring 2017. “I am extremely proud and satisfied that we have managed to acquire a property cluster in one of Stockholm’s largest city development areas, and thereby strengthening our customer offering in central Stockholm. The acquisition means that we will exceed our expansion goal for 2017 as we reach SEK 27 billion in property value already this year, and more than 40 per cent of the total property value will be located in Stockholm”, says Biljana Pehrsson, CEO at Kungsleden. Gärdet-Frihamnen is located in Stockholm’s new city district project Stockholm Royal Seaport. The new area will include 12,000 new homes, 35,000 new workplaces, a modern port and new infrastructure such as the City Tram and the road tunnel project Norra Länken. Financing for the acquisition has been secured through a six year credit from Danske Bank with marked based terms and conditions. Kungsleden AB (publ) discloses the information in this press release according to the Swedish Securities Markets Act and/or the Swedish Financial Trading Act. The information was provided for public release on 16 October 2015 at 2:30 p.m.